It’s June 25th again. Twenty-two years ago today I baked Kelsey his last birthday cake. It was his sixteenth birthday. Yes I baked birthday cakes for my dogs. But I left off the icing. I don’t know who was more excited. My kids loved celebrating birthdays. And Kelsey would see me bake a cake without icing and he knew it was for him. 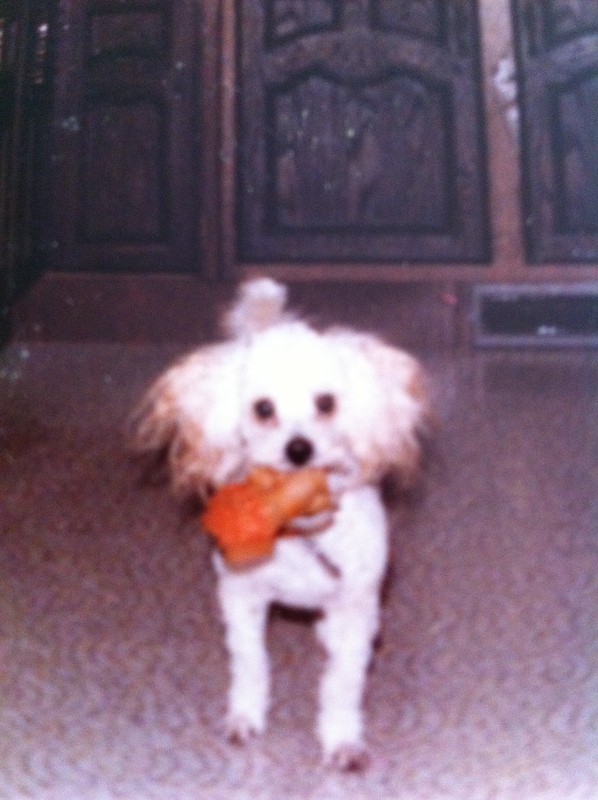 My husband and I had been in our first house for less than a week when I spotted an ad in the newspaper for apricot toy poodles. I had always wanted a dog. And now we had a house and a yard. It was time. So what if the sod wasn’t down yet, or if the fence wan’t built? Who needs a sidewalk anyways? Landscaping could wait. I phoned my mother that day and by the time we arrived at my parents’ house, my mother had made Kelsey a little quilt and there was a dish with chicken for him. But she still chided me because we had just moved into our house and hadn’t unpacked any boxes yet. My reply was that the boxes could wait along with the landscaping. Kelsey was the runt of the litter. He was this tiny lump of apricot fluff. He couldn’t manage a single stair, wasn’t in the least bit interested in being house trained at first, but he really loved the homemade meatballs I used to make him. Dog food? Yuck! When he was a baby, I would take him to work with me. He slept most of the time on a blanket on my desk. I gradually began to leave him at home for small periods of time during the day. He was always so excited to see me when I came home from work. That tail wagged constantly and he would cuddle and give me dozens of kisses. Kelsey loved ice cream, and he knew that he always got his own dish or cone whenever we went out. He also loved pizza. One night when we were eating pizza in front of the tv, Kelsey started barking loudly. He was our watchdog. He would announce the arrival of visitors before the doorbell sounded. So off we went to answer the door. But there was no-one there. When we returned to watch tv, there was Kelsey up on the coffee table having a grand old time with that pizza. Kelsey was extremely intelligent and was house trained in no time. 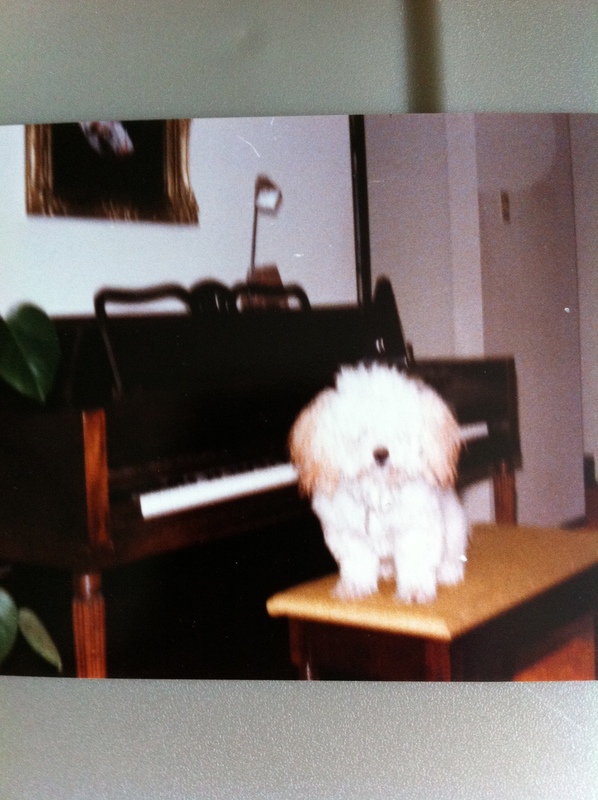 As he grew up, rather than stand by the door to let us know he had to go out, he would play the piano. As it would become more urgent, the speed and volume of the notes would increase. His favorite toys were squeak toys. He chewed at them voraciously until the squeakers wore out. He also enjoyed chewing on small rawhide sticks. I would often take him to visit my grandmother in a nursing home. There was a strict rule that pets were not allowed, but the staff all looked the other way. My grandmother’s friends would all crowd into her room to see the dog, and of course they always had treats for him. He loved to go for car rides, especially when he could stick his head in the air conditioning vent. He enjoyed roaming around in our backyard and chasing birds. He would actually catch birds and bring them to me proudly displaying his prize. Of course I would immediately make him drop the bird and let it go. And he actually once even caught a rabbit in our backyard. Kelsey sported quite a wardrobe as well. My mother made him cable knit sweaters for the winter and we also bought him T-shirts. We even bought him rubber boots, but he refused to wear those. When my son was born Kelsey was very protective of him. He would sleep under the crib. When Kyle awoke from his nap, Kelsey would be tugging at my jeans long before my baby uttered a cry. When I nursed Kyle in the rocking chair, Kelsey was at my feet chewing a rawhide. As Kyle grew and sat in a high chair, Kelsey always waited for food to fall. And Kyle delighted in accommodating him. Kyle also used to throw his soothers to Kelsey, chuckling loudly as the dog chewed them up. As Kelsey grew older he had some health problems. His hearing and his eyesight were affected. He became lethargic when kidney problems surfaced. And about two and a half months after that sixteenth birthday, it was time to say farewell. Love you forever Kelsey, always in my heart.